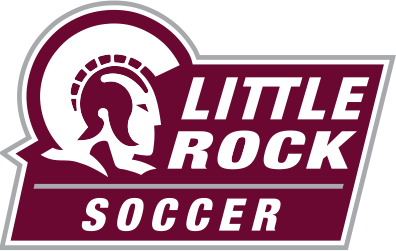 On Sunday afternoon, the Little Rock (LR) women’s soccer team defeated Western Athletic Conference (WAC) competitor UT-Rio Grande Valley (UTRGV) 4-0 at the Coleman Athletic and Recreation Complex thanks to a hat trick by sophomore Erna Gudjonsdottir. Gudjonsdottir, a transfer from the University of Kansas and native of Iceland, had never before scored in a collegiate game. She had three unassisted goals against the Vaqueros (4-5-2), two of which came in the final five minutes of the first half. Gudjonsdottir’s first goal of the match and her career, came in the 31st minute. Liesa Seifert also had a goal for the Trojans (5-5-1, 1-1 Sun Belt), scoring off a header in the ninth minute that was assisted by Jaclyn Purvine. LR outshot UTRGV 11-7 in the first half, and for the match had nine shots on goal to the Vaqueros’ six. Redshirt sophomore goalkeeper Kate Hamilton had her third start of the season on Sunday, but played all 90 minutes for the first time. Hamilton has yet to give up a goal this season, and had six saves against the Vaqueros. The non-conference victory was an opportunity for LR to rebound after its first two Sun Belt Conference (SBC) games, a hard-fought draw against Louisiana and a 1-0 loss at Arkansas State. The Trojans return to SBC action this Friday, Sept. 29, as they host ULM at the Coleman Athletic and Recreation Complex.